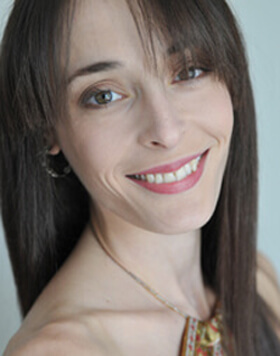 Ms. Chalendard received her training in Marseille under the guidance of Dominique Khalfouni and Marie-Claude Dubus at the Ecole National de Danse de Marseille Roland Petit. She has also studied under the guidance of Youri Vamos in Dusseldorf, Germany, with Vladimir Malakhov in Berlin, Germany, and with Birgit Keil in Karlsruhe, Germany. Ms. Chalendard has also studied with Maina Gielgud and Christiana Stefanou. From 2003 through 2008, Ms. Chalendard was a First Soloist of the Badishe Staatstheater Karlsruhe where she danced the title role in Peter Wright’s production of Giselle, Juliet in Kenneth MacMillan’s Romeo and Juliet, Mercedes and Queen of the Dryads in Don Quixote, Polyhymnia in George Balanchine’s Apollo, and principal roles in Balanchine’s Tarantella, and Tschaikovsky Pas de Deux. She also created the title role in Terence Kohler’s Anna Karenina, and Gamzatti in La Bayadere, the title role in Ray Barra’s Carmen, and Venus in Renato Zanella’s Ars Armandi. In 2008, Ms. Chalendard joined English National Ballet where she was promoted to first soloist. Ms. Chalendard expanded her repertoire to include Odette/Odile in Derek Deane’s production of Swan Lake, Clara/Sugar Plum Fairy in Wayne Eagling’s The Nutcracker, the title role in Kenneth MacMillan’s Manon, the Sugar Plum Fairy in Christopher Hampson’s The Nutcracker, Juliet in Rudolf Nureyev’s Romeo and Juliet, the title role in Mary Skeaping’s production of Giselle, Terpsichore and Calliope in Balanchine’s Apollo, the title role in Roland Petit’s Carmen, the Young Girl in Petit’s Le Jeune et la Mort, and principal roles in Mikhail Fokine’s Les Sylphides, and The Dying Swan, Derek Deane’s Strictly Gershwin, and Serge Lifar’s Suite En Blanc. Ms. Chalendard joined the Boston Ballet in 2013 as a second soloist, was promoted to first soloist in 2014, and was promoted to the rank of principal dancer in 2016. She has danced the role of Gamzatti in Florence Clerc’s La Bayadere, Odette/Odile in Mikko Nissinen’s production of Swan Lake, Marguerite in Val Caniparoli’s The Lady of the Camellias, and the Sugar Plum Fairy and the Snow Queen in Mikko Nissinen’s The Nutcracker. Ms. Chalendard is in demand as an international guest artist. In London she has appeared in performances coordinated by Carlos Acosta creating a principal role in Adam Hougland’s The Young Apollo. In 2009 Ms. Chalendard toured with Carlos Acosta in Italy and Spain dancing the role of Calliope in Balanchine’s Apollo. In 2011 Ms. Chalendard appeared as a guest artist with the Badishe Staatstheater Karlsruhe dancing Odette/Odile in Christopher Wheeldon’s Swan Lake. In 2012 Ms. Chalendard danced the title role in Giselle, partnered by Jozef Varga of the Dutch National Ballet, at the Nureyev Festival in Kazan, and in 2013 danced the title role in Erik Bruhn’s La Sylphide with the Rome Opera Ballet, partnered by international guest artist Rolando Sarabia, and Friedemann Vogel of the Stuttgart Ballet. Ms. Chalendard has also been recognized for her performances with the 1st Emerging Dancer Award while soloist with the English National Ballet in 2010, and among the top 100 dancers voted by Dance Europe Magazine for her performance in the dual role of Odette/Odile in Derek Deane’s Swan Lake in 2012. The Allen Civic Ballet is a nonprofit organization funded in part by the Allen Arts Alliance and by the City of Allen, Texas.